The Way Back Home is an award winning picture book illustration by Oliver Jeffers. It had been adapted to a live stage version and bought to Singapore by I Theater. The production is presented by Big Wooden Horse and Theatre Royal Winchester and adopted for stage by Adam Bampton-Smith. One day a boy finds a plane in his cupboard. He flies his plane higher and higher until he runs out of petrol and lands on the moon. He is frightened, lost and alone until a passing Martian lands there too! Who is the strange alien? Can they be friends? And how will they find their way back home? The stage setting is akin to being in a boy's bedroom. The play started with a girl telling a tale about a boy and started to look for him on stage. It would seem that they are friends and are playing play pretend in the boy's room. 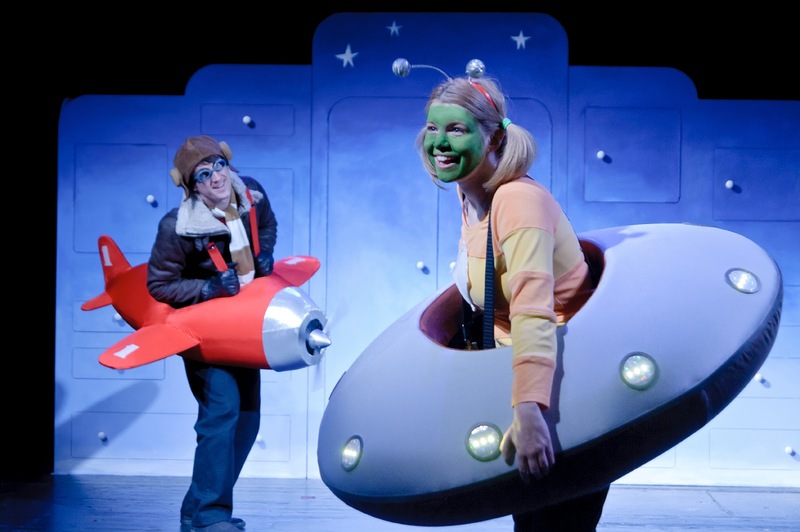 The story unfold through a series of play pretend that led the boy on a plane and flies off to the moon to meet up with the Martian. In between the play, there are a few songs that suit the lullaby mood of the stage. The adapted play is a little different from the book. It was a surreal experience sitting through the play. I asked my boys what do they think the play meant and had different set of answers from boys aged 5 and 8. The younger boy thought the play was a 'dream' while the older one interpret it as one where the main character using his imagination to play. If you are a faithful follower of the book, you may recognise certain parts in the play. If you have no prior knowledge like us, you might end up a little hazy about the plot at the end of the show. With no prior knowledge on the book, the boys ended up with different interpretations of what they had seen. The 2 person cast put up a credible performance as the boy and the Martian; with enough synergy to hold the production on their own. The 50 minutes production is recommended for kids age 3 and above. We do suggest that the children get acquainted with the book before watching the show so they would be able to follow the tale. As far as the setting goes, this would be a show for kids and adults may find this play a tad kiddy (as it was meant to be) . The Way Back Home is now showing at Alliance Francaise Theatre from 12-20 Sep.
TWD were invited to the show for a review. All opinions are of our own.